How do you know if you need braces? When you look in the mirror at your smile, do you like what you see? Are your teeth straight or crooked? Is your bite comfortable? Do any of your teeth collide when you bite, swallow or chew? Sometimes it is easy to spot signs that you may need braces, and at other times the signs might not be readily apparent. At Belmar Orthodontics, we work with you and your general dentist to determine the best course for your oral health needs and to determine if you need braces. Braces is an investment: an investment in your money and an investment in your time. It’s always important to look at factors that determine whether you need braces or not, as you will have braces for about 18 months or so of your life. However, if you do make the choice to receive braces, you can be sure that you are making an incredible investment for your future and for your health. What are factors to consider when deciding if you need braces? Some factors include the status of your smile, your age, health reasons and bite and alignment problems. Do you love the smile you have? Is it a straight smile or is it crooked? Many patients seek orthodontic care because their smile is crooked or could use some improvement. Orthodontic care makes a huge difference when it comes to straightening your smile quickly and doing it correctly. Only an orthodontist has received the education needed to straighten your smile the best way possible. An orthodontist spends about 10-11 years in training and schooling to do orthodontics. That generally includes 4 years of undergraduate work, 4 years of dental school and an additional 2-3 years training in orthodontics. These professionals truly know what they are doing when they make a plan for your teeth. If your smile is crooked, you are a great candidate for receiving braces, no matter if you are a child, teenager or an adult. Straightening your smile is one of the best ways to boost your confidence. In a study conducted by Invisalign, it was found almost 30% of people noticed a person’s smile during a first impression. Those with a straighter smile had a better chance at landing a job than someone with a crooked smile. They were also considered to have a better personality, be more attractive and were 58% more likely to be successful. Investing in a straighter smile can really help you go places in life! You are never too old to receive braces. Children, teenagers and adults are all sporting various forms of braces all over the world. In fact, in just the United States alone, there are about 4.5 million braces wearers each year. About 1/4th of those are adults and a large portion are children as well. The braces you wear depend on your age. For children, most braces are for correcting bite and alignment problems. For adults and teenagers, the main goal is to straighten those pearly whites. Traditional Metal Braces – These are the tried and true method for straightening the teeth. They are also the most economical choice and the top choice for teenagers. Dress these brackets up with colorful bands at every orthodontic appointment! Incognito Lingual Braces – Want the strength of metal braces without having a visible mouth full of metal? Lingual braces are custom-made metal braces for the inside of your teeth (the tongue-side). This hidden apparatus allows you to straighten your teeth in secret, making it a popular choice among adults. Clear Ceramic Braces – Ceramic braces are made from ceramic material and naturally are white just like the teeth. Even the archwires can be made white to blend into the teeth better. For braces that feel like metal braces but hide themselves a bit more, ceramic braces may be for you! Invisalign Transparent Aligners – This is an options that adults love! 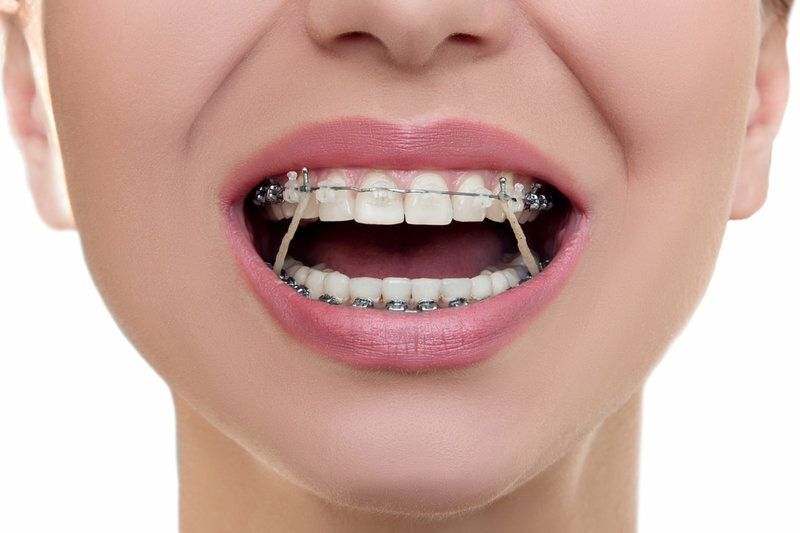 Many adults find metal braces to be childish or unattractive. However, Invisalign treatment has proven to be effective in straightening the teeth. This series of transparent aligners gently pushes the teeth into their proper place in about the same time as metal braces. The aligners can be removed for eating, drinking, sports and easy cleaning. All of our orthodontic options are great for aligning your teeth. Children may need braces if bite and alignment problems are present, and this is actually the reason many children do have braces. During the childhood years, the mouth is still growing and the jaw is still forming. You never want to just let bite and alignment problems go unchecked, as they can create problems such as difficulty chewing, speaking, and talking as well as make the face grow differently and make the teeth harder to clean. Children with bite misalignments need braces between ages 7-9 to correct problems before they become severe in adolescence and adulthood. This will save a lot of time, pain and procedures later on in life. There are many reasons that you may need braces. Straightening the teeth makes them easier to clean and can reduce your risk for tooth decay and gum disease. Orthodontic treatment can improve your appearance, boost your confidence and correct problems with your bite that can become severe later on in life. If you need braces, don’t hesitate to schedule your appointment! Call our Belmar Orthodontics office today at (303) 225-9016.